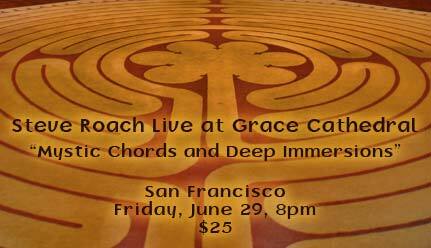 Join Steve Roach for this very special evening of pure atmospheric-space-ambient music with complete respect for the reverberant acoustics and sacred space of the Cathedral. 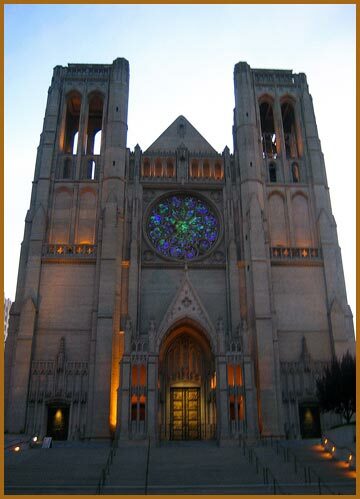 Grace Cathedral is the daughter of historic Grace Church. The first little chapel was built in the gold rush year of 1849, and the imposing third church, for a time called Grace "Cathedral," was destroyed in the fire following the 1906 earthquake. The railroad baron/banker Crocker family gave their ruined Nob Hill property for a diocesan cathedral, which took its name and founding congregation from the nearby parish. Dean J. Wilmer Gresham nurtured the young cathedral, and work began on the present structure in 1928. Designed in French Gothic style by Lewis Hobart, it was completed in 1964 as the third largest Episcopal cathedral in the nation. Famed for its Ghiberti doors ("The Gates of Paradise"), labyrinths, varied stained glass, and medieval and contemporary furnishings, as well as its carillon, organs, and choir, the Cathedral has become an international pilgrimage center for church-goer and visitor alike.